A high-quality STEM learning toy offers limitless opportunities for open-ended play, will keep your child entertained for hours, and nurtures their interest in science, technology, engineering, and math. 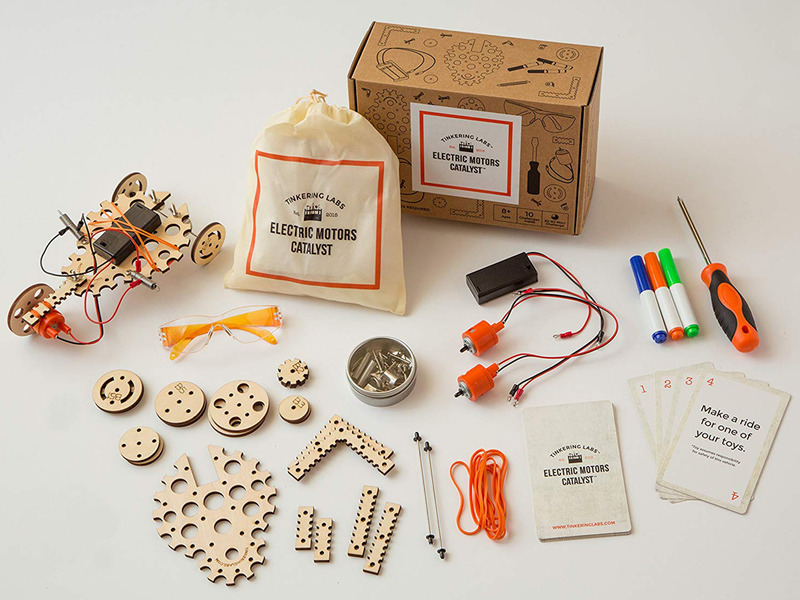 I liked the Tinkering Labs Electric Motors Catalyst STEM Kit because you don’t need a smart device to play with it, there are several fun challenges, and it was a great introduction to engineering for kids. Though it is more expensive than most STEM learning kits (currently $59 on Amazon), the set comes with over 50 parts and can be used with a variety of the most popular robotics kits. One of the biggest challenges in my house is trying to pull my sons away from video games and passive media like YouTube, Netflix, and other streaming services. I’m not a monster. I let them have some screen time, but I try to limit it. I’ve found simply telling them to turn off the computer is not enough. I need to have a good diversion. This is where the open-ended play of STEM toys is helpful. Tinkering Labs recently sent me their Electric Motors Catalyst STEM Kit to test. Here are our experiences with it. The Tinkering Labs Electric Motors Catalyst STEM Kit comes with safety glasses, electric motors with wires, a battery pack (two AA batteries included), a wooden chassis, axles, wooden connectors, washable markers, a giant piece of paper, bolts and wingnuts, L-brackets, springs, about a dozen wooden wheels, bushings, rubber bands, a screwdriver, 10 challenge cards, and a drawstring storage bag. Everything you need to get started comes in the box. And, if the 50+ parts that come in the kit are not enough for you, there are expansion sets available on the Tinkering Labs website. Out of the box, it all looked overwhelming. My five-year-old son, Bucky, was excited to play with the set and figure it out, but he needed help. Heck, I needed help. Unfortunately, my 16-year-old son, who has years of robotics experience, was too busy with teenager stuff to save us. So, I had to watch tutorials and really read the information in the provided booklet. In the time between opening the kit and finally playing with it, I lost the user manual. „No problem,“ I figured. „I’ll just pull it up online.“ No luck. So, I had to go back to my horribly disorganized files to find the manual. And after about 15 minutes, we had the booklet in hand and were ready to play. For our first challenge, we chose „build a machine that draws curvy lines.“ I had to do most of the work while Bucky started his own project. I engaged Bucky for simple parts of the construction, but a lot of it was too hard for him. He basically barked orders at me while I strained to make his ideas a reality. In the process, I explained why some of his ideas were beyond the scope of the kit. To be fair, the recommended age for this toy is eight to 12 years old. After half an hour of trying to conquer the challenge, we ended up with a circle-drawing maniac. It started as a car. Then, we lost a wheel, and things went off the rails. The robot drew crazy circles while Bucky cheered it on. The whole time he had the biggest smile on his face. I liked that the kit pushes kids to be creative without holding their hand too much. There is a lot of trial and error before youngsters can create a machine that works well. It’s in this trial and error that your child will learn about engineering and science. I also liked that the play is open-ended. There are virtually limitless ways to enjoy this kit. You can even incorporate household items and parts from other robotics sets. Up until the Tinkering Labs Electric Motors Catalyst Kit, every STEM toy I’d tested required the use of a smart device, which means screen time. Granted, it’s quality screen time that takes your child away from YouTube or other mindless media, but it’s still screen time. With the Tinkering Labs kit, there’s no need for screen time. You might want to check out tutorials, but your young one can have a great time without a smart device on hand. I could not get the on/off button on the battery pack to work correctly. It seems cheaply made. Our motors would lose power for seemingly no reason while the switch was in the on position. On other occasions, the motors would keep running once the unit was off. This was frustrating. Two of the rubber bands broke pretty quickly, which was also frustrating since these are used to keep the battery pack and motors on the robot. Of course, we could use any old rubber bands for the task, but I would have liked something less MacGyver-like to keep these elements attached to the chassis. Another durability concern is the motor wires. The insulation frays easily so you need to be careful to secure the wires away from moving parts, such as the wheels. We learned this the hard way. Fortunately, we did not wear all the way through the insulation, and the wires did not lose their ability to operate properly. Lastly, I didn’t like that I had to help Bucky every step of the way. To be fair, this has more to do with his developmental age and isn’t due to any failing of the toy. After all, it is meant for kids at least eight years of age. I’m excited to see what Bucky can do with this once he’s a year or two older and able grasp the concepts behind how the elements of the kit work together. Meanwhile, it’s a fun toy for father-son time. 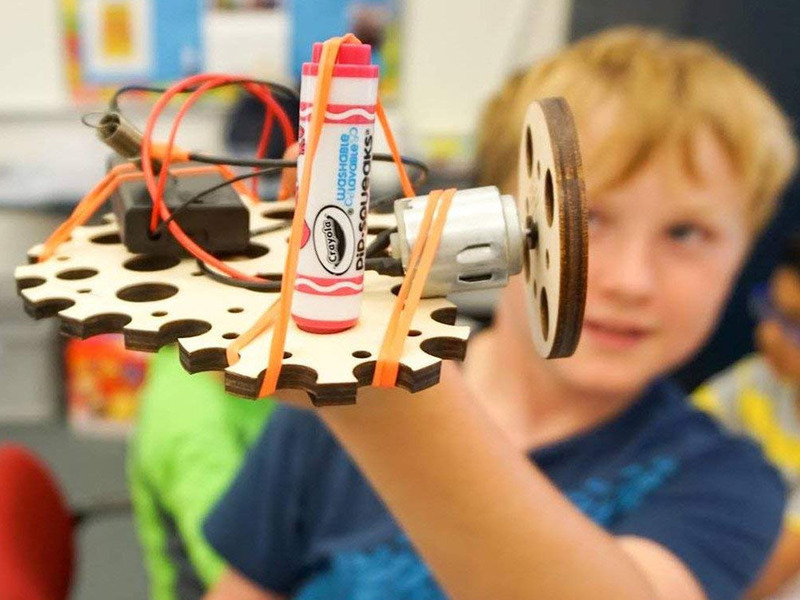 Despite the durability concerns, the Tinkering Labs Electric Motors Catalyst STEM Kit is an excellent kit that offers countless ways for your child to play, pushes them to learn engineering concepts, and challenges them to think outside the box. Overall, I would recommend it if you are looking for a toy that nurtures the STEM skills of a youngster between the ages of eight and 12 years old.